For my 100th View, I went to the Everson Museum of Art in Syracuse, New York, to see the Turner to Cezanne: Masterpieces from the Davies Collection from the National Museum of Wales. This collection featured works from Turner, Monet, Renoir, Van Gogh and Cezzane. Photography was not permitted for the Davies Collection. However, if you enjoy photography and are looking to improve, I encourage you to study artists who work in different mediums from canvas to stone. How they used color, composition and, yes, even light, will help you when looking through the viewfinder or LCD. The Everson does allow photography for their permanent collection which includes a large collection of ceramics from pre-Columbian to today. I found these works fascinating and historic. The Onondaga Pottery Company which you may know as Syracuse China had several pieces in the collection. 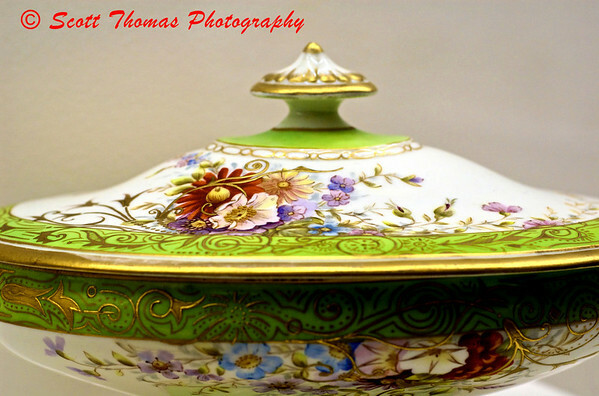 Including this casserole dish, a very colorful and ornate piece of dinnerware. Syracuse China casserole dish on exhibit at the Everson Museum of Art, Syracuse, New York. Later I found this bust of Charles Lindberg done in porcelain by modeler Bertram L. Wakin working for the Onondaga Pottery Company (Syracuse China) in 1927. An historic figure captured in a fragile and beautiful medium. 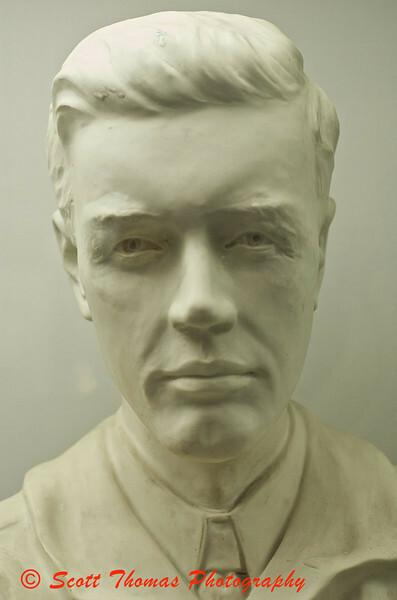 A porcelain bust of Charles Lindberg in the Ceramic collection at the Everson Museum of Art in Syracuse, New York. I had a good laugh at this next piece. Done by Canadian artist, Wayne B. McClean, titled The Statue of Man’s Liberty to Do It Yourself. It’s good to be able to laugh at ourselves and to see it depicted in such fine a place as the Everson Museum. 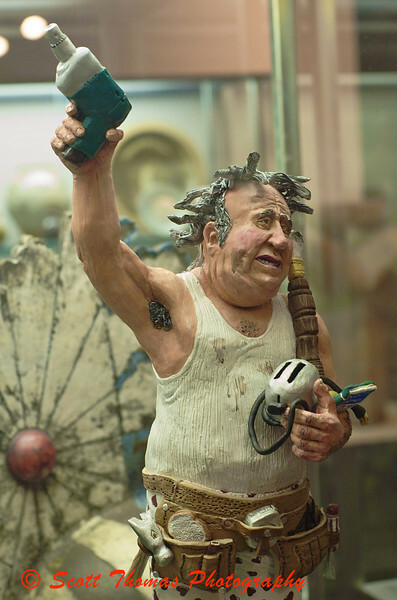 The Statue of Man's Liberty to Do It Yourself by Canadian artist Wayne B. McClean in the Ceramic collection of the Everson Museum in Syracuse, New York. To my fellow Do It Yourselfers, this one’s for you, guys! Photographing in a museum is challenging. The rules at the Everson allow it only if no flash or tripods are used. With that in mind, I took my Nifty-Fifty, Nikon 50mm f/1.8 lens, and set my base ISO at 640. You have to watch out for how the pieces on exhibit are lighted. Some were under incandescent while others were under fluorescent lighting and I had to change my camera’s white balance accordingly. This entry was posted in Weekly View and tagged ceramics, china, everson museum, new york, Photography, syracuse. Bookmark the permalink. He’s wonderful, the DIY man. I like the light on the Lindbergh bust too. Isn’t he great? Here I was seeing some of the masters of impressionism and I choose to highlight this guy. Oh, well, I enjoyed both. Nice choices, Scott. I like to visit galleries and museums, too – it gets my mind off the gerbil wheel and out in the meadows where it can play. The Everson has quite the range of art. It does awaken parts of the brain needed to see things differently. However, tomorrow I’ll highlight one that left my brain a bit puzzled. I like the name, “The Statue of Man’s Liberty…”, he looks funny in his outfit, I see still in his boxer shorts. Great first picture! I also really like the last. I think the artist did a piece of art at the Cleveland Museum of Art. Okay, I’m not quite that enamored with the last one (looks like we’ve seen him somewhere lol), but I love the shots of the other ones. This handyman is SO funny, I realy like the expression of the face. This artist has a great humor, and you have apparently Your photo is taken from a good angle, and in a good light. Looking for information about the artists -on Google-, didn´t give any result, I would like to see more of his work. Do you know if he uses some kind of nickname? Congratulations with the 100 views!